Again, a sell out for this popular annual festival at Larford Lakes. 60 anglers made their draw for sections on both the Specimen, Match and Arena Lakes. 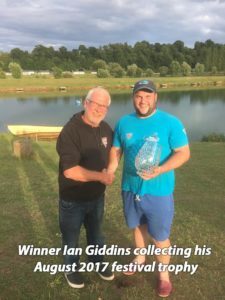 Scored on a points system with weight coming into play in the event of a tie it was local angler Ian Giddins who finally took the honors. Ian had a favorable draw on most days and made full advantage of 3 end pegs out of five. That being said, he fished a superb festival scoring 7 points and a total weight of 290-220kilos (644lbs) averaging 129lbs per day. 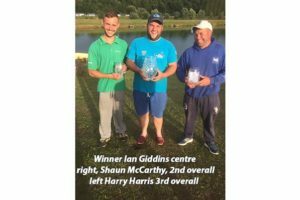 The Bag’em sponsored angler collected £1000 plus lake and section wins totaling around £1500 in prize funds. Second overall was Shaun McCarthy (Mossella) who fished brilliantly from some difficult pegs. Shaun also scored 7 points in total but had a lesser overall weight of 233-550kilos (518lbs) 103lbs per day. 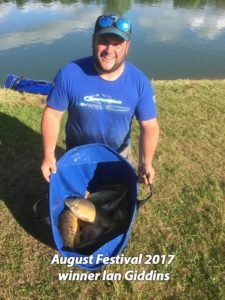 Local angler Harry Harris (Larford) turned in a great performance scoring 9 points over the 5 days and recording a weight of 222-360kilos (493lbs) 99lbs of fish per day as an average. Fourth overall was Grant Albutt (Drennan) scoring a point total of 9 but decided by weight with 182-480kilos 405lbs. Sixth place went to Andy Power (Preston) with a 10-point total and an overall weight of 229-280kilos (509lbs). Due to the popularity of the event, names are already being taken for the 2018 event.